Mohali, April 9 (CRICKETNMORE): David Warner took a sly dig at R Ashwin in relation to the 'Mankading' controversy during Sunrisers Hyderabad's IPL game against Kings XI Punjab on Monday night. 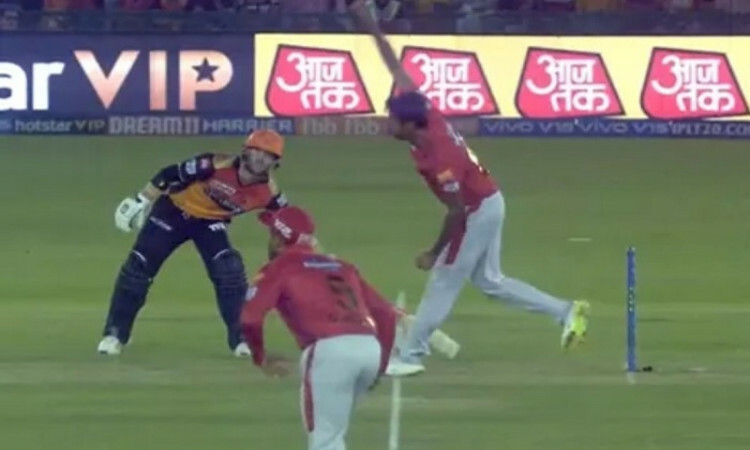 In the seventh over of the SRH innings, Warner was at the non-striker's end when KXIP skipper R Ashwin came to bowl and the Aussie was spotted exaggerating his backing up as Ashwin delivered the ball. That wasn't the end as Warner kept at it and acted to be much more cautious when at the non-striker's end during Ashwin's overs. Kings XI beat Sunrisers by six wickets in a thrilling last-over finish. Warner helped Sunrisers post a modest 150/4 with an unbeaten 62-ball 70 - an innings which was unlike his usual aggressive knocks. Rajasthan Royals batsman Jos Buttler was 'Mankaded' by Ashwin at a crucial moment in their opening match of the season and Rajasthan went on to lose the game. The manner of the dismissal created ripples across the cricketing fraternity and beyond as many former greats lambasted the Indian off-spinner for breaching the 'spirit of the game'. Ashwin recently said he didn't have a reason to defend his decision to 'Mankad' Buttler, adding that his 'conscience was clear'. "There is nothing to defend. As I said in the press conference that day, it happened instinctively, it was not a plan that 'Buttler will go outside (the crease) and I have to get him'. Although he did do it four or five times. They didn't want to take risks against my bowling that day, so what they were doing was pushing the ball on the leg side and trying to take twos. "I saw that he'd done it (backing up too far) four or five times, and it's there in the rules that if the batsman goes out of his crease, you can run him out. It's the batsman's responsibility to stay behind the crease," he said. Buttler had said that he wanted further clarity in the law. "Of course, a 'Mankading' has to be in the laws of the game, because a batsman can't just run halfway down the pitch trying to get a headstart. But I do think, the way the law is written, there is a bit of a grey area in that saying 'when a bowler ...is expected to release the ball'. That is a bit of a wishy-washy statement," he had said.